You may remember that years ago, I “played” minister for two smalltown United Churches of Christ (same place where Henry was my dog - previous eletter on Deliberate Thoughts). Before I left the territory, my young college student replacement told me about a sermon he had given to his new congregations on the miracle of the Loaves and Fishes. In the world of miracles, is a Big Miracle any harder to do than a Little Miracle? Probably not. I believe that all or most of the Holy Bible is written to be considered symbolically. But, that doesn’t discount that many of the events (especially in the New Testament) were literal happenings made to occur for the benefit of the “people in the seats.” Jesus suggests that to be so in a number of cases. Further, I believe that Jesus Christ (a Great Magician, Teacher, and Physician) did in fact turn water into wine, raise sleepers from death, and materialize loaves and fishes for the thousands. Actually, I have no doubt about it. Just wish I had been there to sit it. Maybe not, I am no doubting Thomas. I didn’t need to be there. I am reminded about some of the Little Miracles that George Burns did in the movie Oh God. They weren’t proof enough. John Denver and his friends needed more. Little Miracles are not enough for some and real faith (deep knowledge) is more than enough for others who have not seen, but still know. That brings me back to the lesson and proposition of Astrology 105. Even the Disciples, who were there when Jesus delivered beaucoup loaves and fishes on more than one occasion, were worrying about not having any bread to eat on a different occasion. Oh, ye of little faith! Jesus, of course, knew his disciples as much as he knew himself. He knew their thoughts, their desires, their past and their future. He read their hearts, their minds, their auras. He knew that he may have chosen “the cream of the crop” to be his close followers, but that didn’t make them all bright and wise in a hurry even with three years of direct teaching and close experience. So, the disciples fell short. They didn’t even get the significance of the feeding of thousands. Nor did they understand the symbology of the remaining baskets full of loaves. When I broke the five loaves for the five thousand, how many baskets full of broken pieces did you take up?" 1) They were LITERAL happenings. Jesus moved the ethers and brought loaves (and fishes) in quantity into manifestation. Someday, we too will manipulate energy as we do matter in the present. 2) The original Miracles had MORAL messages, like my young minister friend suggested. Generosity, love, sharing. 3) The Miracles are grist for meditation. They are SYMBOLS of larger energies. So, I will address the last two angles quickly and leave you for more pondering on your own. 4) In our part of the Universe, the Christ Principle works through the Seven and the Twelve. 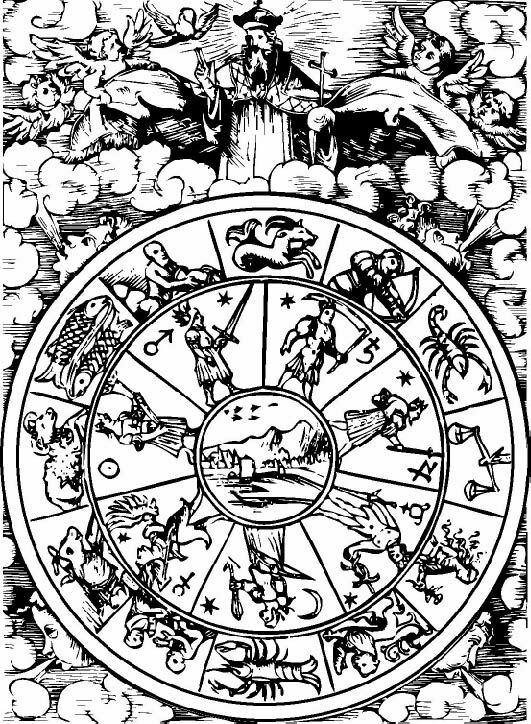 These are the Seven Planetary Spirits of our Solar System and the Twelve Signs (Constellations) of the Zodiac. This partly explains the great Covenant of the Old Testament. The Septenary Rainbow Bridge. (Genesis 9:17) The Seven aspects of the Christ Consciousness appear abundantly in our material world. The Twelve Tribes of Israel, the Twelve Apostles, the Twelve Months, Twelves Hours (X 2 in a day), the Twelve Petals of the Lotus of the Soul, etc. are manifestations of a second layer of Christ Power. The Christ of two millennia ago expressed both Love and Wisdom. Well, where does that get us, you may be asking? • There is rhyme and reason to the Heavens and how they were created. • The Great Scriptures have much deeper meaning than we generally think. • The Christ is not just a man or the inscrutable Son of God, but first a great energizing, mediating Principle in the Universe. Other attributes of Christ Energy follow therefrom. • The planets and stars (not just the Sun) in our branch of the Universe carry life-giving energies through the Sacred Seven and Twelve. Portrayed graphically by Jesus and the Miracles of the Loaves. This may be deeper than you want to go or know. If it is necessary and important for your understanding, you will see it again.